South High is one of Worcester's most committed schools, filled with motivated and caring teachers, staff, and administrators. Working for Worcester is greatly proud to have the opportunity to work close with the schools teachers, students, and principal Maureen Binienda. Working for Worcester started working with principal Binienda and the staff at South High in October of 2012. Principal Binienda made us aware of an incredible program that South High offers to its students. In South High’s basement there is a preschool and daycare program that exclusively serves the children of current South High students. This program allows young mothers and fathers to stay in school and get their diploma with their child is near by in a safe space. The daycare and preschool have both outgrown the old play structure, which was having a bit of a mold problem considering it was shaded by large trees. Next to this undersized “play-pen”, Working for Worcester saw potential and got creative. There was a giant overgrown bush that took up the otherwise open space, which was covered in poison ivy. WforW hired a professional landscape construction company to manually remove all of the poison ivy and guard against its return with all natural remedies and tactics. 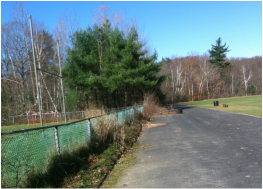 Next WforW leveled the land and installed a commercial grade fence for the new, much larger, play area. 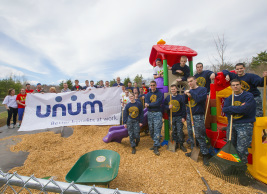 On Saturday April 20th, college hockey players, members of the US Navy, employees from Unum, experts from Consigli Construction, and dozens upon dozens of enthusiastic college student volunteers came together to plant arborvitaes and mulch the new playground. Then they literally built a brand new PLAY CASTLE together. 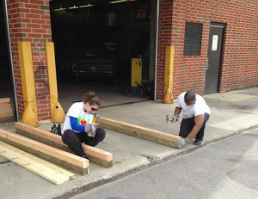 Elsewhere at South High, the volunteers landscaped and even created new flowerbeds all around the entrance of the school, as well as, they built three new raised beds for the community gardening program. One of the beds was built at a special height, and in a special location, so that the handicapped life skills students can have their own gardening space to supplement their class work and programs. The volunteers from the Navy worked incredibly hard, clearing multiple dump trucks worth of brush out from the schools front path. 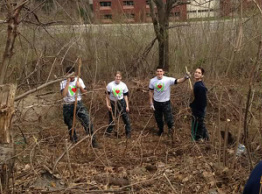 Finally, the volunteers cleared and landscaped an outdoor classroom out of an old, and buried, stone amphitheater. The teachers are very excited about the new classroom!!! This project was made possible by the incredible generosity and support of Unum. 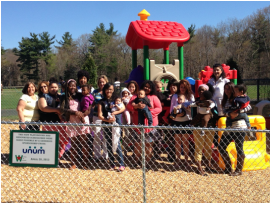 Unum sponsored the entire renovation at South High and dozens of Unum employees, including a Senior Vice President, joined the volunteers and created not only a great new recreation space, but also an incredible moment of community. Cite manager Derek Kump planned and coordinated all aspects of the South High project. To learn more about Derek and the rest of the managing team, click here.